Many thanks to Alex for organizing, Axel for hosting, and Jdaw for arranging. A hat tip to Christian for bringing the stunning magnum of '55 Pichon Baron. 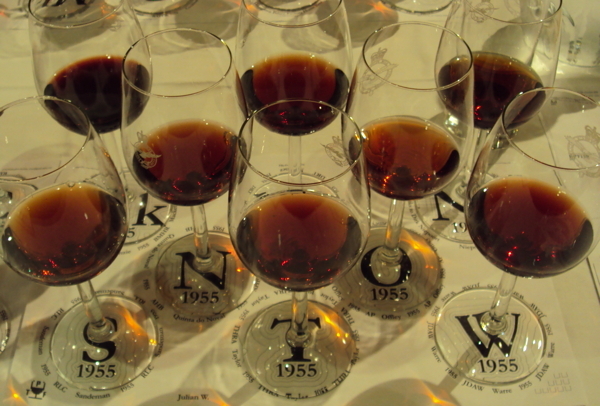 Really a great treat to taste 17 bottles from 1955. My WOTN of the night was the aforementioned PB, but I thought the ports as a class showed quite well, and even if they're past their prime (as I thought was the case in virtually all examples), they are still giving pleasure. POTN was the Grahams (91), followed by the Fonseca (89), Taylor (88), and Ferreira (88). I noticed I scored these wines more conservatively than most in attendance, and don't know if that owes to my greater interest in fruit (which I thought was generally lacking somewhat, owing to the ages of these wines) or just due to the fact that I haven't tasted VP since mid-July. Anyway, thought they were very nice, but not something to seek out given today's prices. Lastly, as a long time fan, it was a treat to finally meet Roy Hersh. Seems very well deserving of his exceptional reputation. Thanks again guys -- great night! 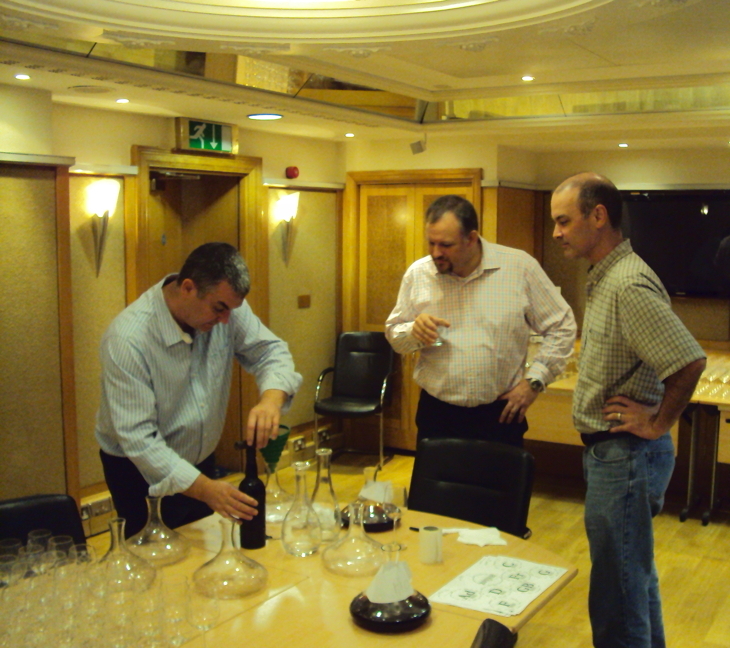 Firstly, thanks to Alex for all his organisation - another excellent tasting. It seems that Julian's fastidious glass washing is the key to allowing the port to show to its best potential at the RAF club. Dinner, as ever, was excellent. I know very little about red wine, beyond knowing I like it! The 1955 Pichon Baron was a revelation to me. The oldest red wine I have had the pleasure to try and I would never have guessed it was that old from tasting it. Christian - thank you for bringing this along. So, to the port! My overriding memory of the 1955 will be the general consistency, with only a couple of exceptions. The Graham was superb and is rapidly becoming one of my favourite houses. My other favourites were the Noval, Niepoort and Taylor. 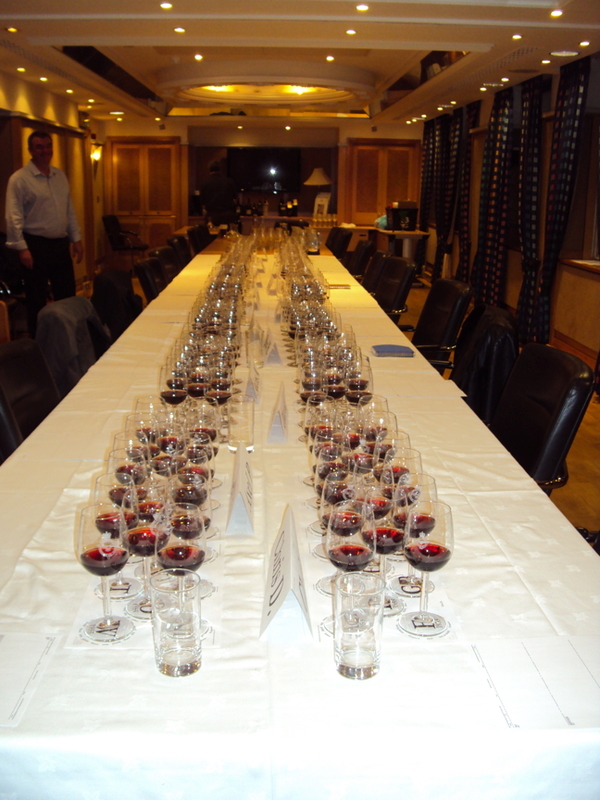 A general theme I did get was lots of spice and little fruit to taste in most cases. Nothing overpowering though, and in many cases my notes say thinks like "very drinkable". I would probably echo Chris D's comment - were cost not a factor I would happily drink a lot more of this, but I would probably drink most of it up in the next 10 years or so - and be very hapy doing so! A very interesting tasting. Good consistency of colour (red, mid-opacity), and generally light on the bouquet nose. Graham delicious; Niepoort weirdly so. And the dinnertime Claret, a magnum of 1955 Chateau Longueville au Baron de Pichon-Longueville, was fantastic. Even the dynamic of tasting-time conversation worked, mostly. A very well-spent evening. Thank you AHB for driving this forward. A splendid evening. My favourites of the evening were Graham, Cockburn, Fonseca and Niepoort. I suspect that Dow would have figured higher in the pecking order but for the TCA taint and the Taylor just seemed to be hiding something from us. The debate about the Mackenzie was interesting. I am 100% in the camp that think that this was definitely not a 1955 port. There were some photos taken at the end of the evening that will hopefully be posted as they show this wine as very much the odd man out in the line-up. Thanks to Alex for organising, Alex and Tom for supplying most of the bottles, Dirk Niepoort for his generosity in allowing us to taste the Niepoort and Christian for his company and that fabulous magnum of PB55. I have continued Mackenziegate here to avoid clogging up the discussion on what was a fantastic tasting. Concentration on the task from DRT BMHR GEE. There are no prizes for spotting, hidden in the shadows, a happy thirsty person. Nearest row: Fonseca, González Byass, Graham. [url=http://www.theportforum.com/viewtopic.php?p=38049#p38049]Here[/url] jdaw1 wrote: Empties of the second flight. The bottles, rotated for easier viewing. Not shown as IMG to reduce download time of this page. I had an amazing afternoon and evening. Many thanks to all who participated, but especially to Alex for organizing, Axel for hosting at the RAF Club, Derek and Julian for their preparations, and Christian Seely for his insight and wit. As usual I detected no trace of cork taint at all. For me even the Buckingham Palace Blend was beautiful. Color across the board was surprisingly dark - to me even the lightest looked no older than '63 with most falling into the '70 range. I'm not convinced that the Mackenzie was a fake (debate here), but it was decidedly darker than even the next darkest Adam and so it seems that there must be something going on. Perhaps some elderberries if not an outright forgery. My Port of the Night was the Graham (92), followed by the Adam (91) and the Taylor (90+). Honorable mention to the Noval and Mackenzie, both at 90, being the only other two that I rated excellent. Nothing scored lower than 85, which is the low end of "very good" by my scoring, so not a stinker in the bunch. I thought the Taylor had by far the best eye - not darkest, but prettiest - while the Niepoort had the best nose and the Graham had the best palate. Out of necessity we were proceeding too quickly for me to get good impressions of finish. I was not last - that honor belongs to Roy or Alex. Dinner was excellent, though I doubt I would order steak & kidney pie on my own. The '55 Pichon Baron was so good that even I enjoyed it, and I don't normally like or drink red wine. Out of respect for the wine I donated the last half of my glass to those who could appreciate it, Roy and Julian being the beneficiaries. Glenn E. wrote: Out of respect for the wine I donated the last half of my glass to those who could appreciate it, Roy and Julian being the beneficiaries. For which I repeat my earlier thanks. I had a terrific night and it was a real pleasure to see a few folks I've not seen for a fair while. My thanks go to Christian for a lovely bottle of red wine; Dirk Niepoort for providing a bottle of the 1955 vintage that was impossible to find; to Axel for helping with the venue arrangements; to Julian and Derek for pouring everything while I laboured in meetings in Milton Keynes; to Tom for providing over half of the bottles we drank that night and to everyone for participating in such a fun night. There were so many firsts for me that evening. The first time I have drunk any Pichon Baron as old as the 1955 - I think my previous oldest was 1983! 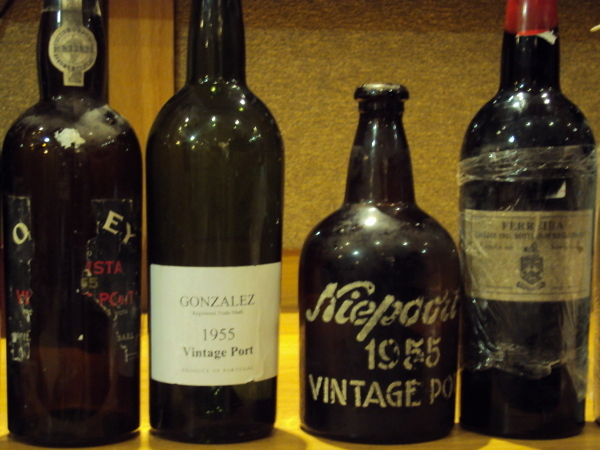 Before tonight, I had only drunk the 1963 from Adams; never drunk a Factory House blend; never had a Ferreira or Noval 1955; never had a Gonzalez Byass or a Niepoort older than the 1970 or an Offley older than the 1963; never had a Mackenzie; and never had the Sandeman 1955. What a night! We'll have to do it again, one day. I too had a fantastic evening, and would like to reiterate the thanks to all the usual suspects named upthread. My first impression, other than pleasing waft of port that had filled the entire RAF club lobby by the time I arrived, was the consistency of colour across the flights (and later, JDAW's ability to distinguish between them in his TNs), but with the Fonseca the standout for me in terms of depth (leaving aside the suspect MacKenzie). I hesitate to come up with scores as I'm not convinced that absolute numbers really give justice to the overall experience at this type of tasting, but if pushed I'd put G at 93/4 and wine of the night by a clear point and a half. A few highlights of night: being taken aside by a quite obviously perturbed JDAW and chastised in hushed tones for errant pronunciation of Sandeman, Derek's contemplative frown as he eyed the McK with deep suspicion, and the education I received over dinner in wine descriptors from Nicos and highly imaginative vulgarities from Chris, who has a good claim to be America's answer to Jeremy Clarkson in terms of catchy one-line put-downs! RAYC wrote: It was immediately apparent that I was in the company of some seasoned critics as I made my way quite happily through several ports which were described variously as "dishclothy" and "deeply flawed"! In particular (and in slight contrast to those around me) I enjoyed the Adams, which I thought felt was wonderdfully syrupy in the mouth. You weren't alone - I had the Adam as my #2 on the night behind only the Graham. But then I have the excuse that I cannot detect TCA at all. 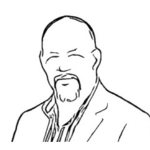 Was the Adam one of the allegedly corked bottles, or was that limited to the Buckingham Palace Blend (which seemed fine to me) and possibly the Dow? In the [url=http://www.theportforum.com/viewtopic.php?p=38068#p38068]1955 Adam[/url] thread AHB wrote: Unknown shipper, cork simply branded Adam's 1955. Deep red with a hint of burnt brown, 60% opaque. Warm and spicy nose, really attractive. Delightful mouth feel, great palate presence with a fabulous combination of burnt sugar and rhubarb. Big aftertaste, coating the mouth with brown sugar flavours and bringing a good length. A great wine. 91/100. AHB is very sensitive to 2,4,6-Trichloroanisole: if he didn’t record any, there wasn’t any. It was only the two mentioned that were corked. Does anyone have a reliable method of reaching Christian Seely? I sent him an email (to the address on his business card) but have received no response. I'm worried that his spam filter may have intercepted my email or something. Please send me a PM if you know how to contact him. Thanks! He does not always reply quickly to emails. You have a PM coming. Thanks - I'll wait a couple of days and then take your advice. It hasn't quite been a week yet, so I'll give him at least that long before I try your alternative. Thanks to Alex and the others responsible for putting this great event together. It was excellent to see so many friends from the UK and meet a few chaps whom I've never had the pleasure to meet in person, only knowing their online personna. The 55@55 Port theme was well executed and having Christian there as the guest of honor was a very nice touch. The oldest PB I'd had until that night was 1957 so the opportunity to try the '55 from mag, was a real treat and did it ever show well. Near perfect for its age; sumptuous and virile. I enjoyed dinner as that was my first time tasting that particular dish and I liked it very much, especially in pairing along with the Claret. I am mostly done with my article and photos of this event which will appear in my upcoming newsletter and I have resisted reading anyone's tasting notes here so that I could proceed without any bias whatsoever. 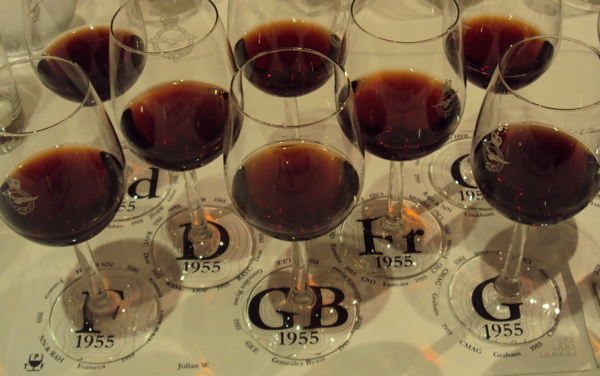 I hope to do justice to such a wonderful evening and share it with Port lovers far and wide. "Roy, will you please get out of the way!?!?!" was bellowed within the first two minutes of my walking into the room and I must say, I got quite a good from that sense of urgency. Thanks Julian!